From left Hank Roberts, Peacemakers Inc.; J'Mya Martinez, Rainin 3zz; John Ivey, Peacemakers Inc.; Mike Norris, 'Pitch to Success'; and Carol Tolbert, Civic Pride at the Inaugural Peacemakers Inc. Donor for Peace Fundraiser, honoring youth focused non-profit organizations in the Bay Area. The organizations spotlighted this year by Peacemakers Inc. were Rainin 3zz, a West Oakland-based AAU girls Basketball team coached By Darren Vance and represented by 13-year-old McClymonds scholar-athlete J’Mya Martinez. Also honored were Civic Pride, founded by former Oakland School Board Member Carol Tolbert; and ‘A Pitch to Success, The Mike Norris School of Baseball Wellness, founded by Executive Director former Oakland A’s pitching ace Mike Norris. The keynote speaker was District 3 Councilmember Lynette McElhaney. The event was held at Everett & Jones and featured entertainment by the Westlake Middle School jazz ensemble and the Destiny Muhammad Jazz Trio. The event was Hosted By Peacemakers Inc., is a non-profit founded in 2000 by Hank Roberts. The event was organized by Peacemakers Director of Development and former Oakland business owner John Ivey. 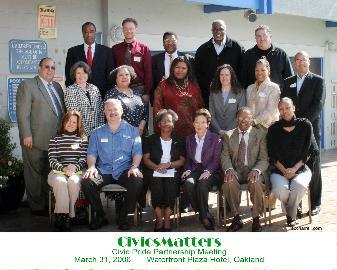 Civic Pride 'CIVICMATTERS" March 11, 2006 partnership meeting. WHY: To provide students in grades 6 through 12 an opportunity to hone their leadership skills, talk to representatives from President Obama's and RNC campaigns, as well as local candidates and office holders; and to learn about volunteering, school and college success, career readiness, scholarships, skill trades, character development, health, financial planning and earn community service hours. WHO: Civic Pride, Inc. is a volunteer nonprofit youth-service agency, founded in 1989 that works with schools, churches, businesses and organizations to provide youth with the knowledge, skills, attitudes and behaviors to be successful in school, college, workplace and within our communities. The organization also recognizes individuals, businesses and organizations that make a difference in our communities. Civic Pride has been making our communities better places to live, work and grow since 1989! Civic Pride Pays Tribute to Al Davis, Remembers 9/11 First Responders, Acknowedges Youth Scholars, and Honors Civic Leaders at Scholarship & Awards Dinner. (Oakland, CA) October 27, 2011 - "A special tribute to Al Davis and Raider Organization for 17 years of support is now added. Additionally the efforts of first responders were illuminated on September 11, 2001 creating a special appreciation for fire fighters, the Red Cross and police officers in our local communities and across the country", says Carol Lee Tolbert, Civic Pride executive director. This month local first responders receive special recognition at the annual Youth Ambassador Scholarship & Civic Awards dinner hosted by Civic Pride Inc., a volunteer nonprofit youth-service agency in Oakland dedicated to youth achievement and the contributions of individuals, businesses and organizations making a difference in our communities. The dinner will be held on Thursday October 27 at the Waterfront Hotel, 10 Washington Street, Oakland from 6pm to 8pm. Registration begins at 5:45pm. Tax deductible tickets are $35 online and $40 at the door. Donations of any amount are welcome. All proceeds support the Youth Ambassador Scholarship Program and annual 'Knowledge Is Power' Youth Leadership Forum for local middle and high school students. This year's recipients of the Civic Award for Distinguished Community Service include Assemblyman Sandre Swanson, retiring Oakland City Councilwoman Nancy Nadel, Richmond Councilman Courtland Booze, Clausen House, Deaf and Disabled Telecommunication Program, and other civic and community leaders making a difference. The 'Knowledge is Power' Youth Leadership Forum is the second event hosted by the organization on Saturday, October 29 also being held at the Waterfront Hotel. "The University of California, Berkeley, Historically Black Colleges, other colleges, skill trades and other resources will be on hand to offer students and their parents' guidance, and recommendations on how students can successfully complete high school, prepare for college and participate fully in our communities", says Tolbert. In addition, 'Knowledge is Power' brings together business leaders, dignitaries, and others to engage students in panel discussions, workshops and interactive activities that emphasize strategies for staying on track. For free admittance, visit www.civicpride.net to download your youth leadership admission coupon. "We're excited to kick-off Civic Pride Awareness Month by hosting our annual fundraising dinner that supports the 'Knowledge is Power' Youth Leadership Forum and Youth Ambassador Scholarship Program", said Mrs. Tolbert, founder and agency volunteer. "Since 1989, Civic Pride volunteers in partnership with corporate, public and individual supporters have worked tirelessly to engage local youth in activities that inspire civic participation, foster good character, promote responsible leadership skills, and emphasize the importance of a quality education. All of which is the foundation for developing healthy, caring and productive young people", says Tolbert. The veteran volunteer concludes by offering these comments, "Programs like Civic Pride help to reduce youth violence and other antisocial behavior by offering young people meaningful alternatives. Both the Youth Ambassador Scholarship Program and 'Knowledge is Power' Youth Leadership Forum help our kids gain the critical skills, attitudes and behaviors needed to succeed academically and within our communities," remarks Tolbert. For dinner tickets or more information visit www.civicpride.net , or call 510.450.1844 or email kids@civicpride.net.